You may receive updates from Boston Socialist Alternative, the sponsor of this petition. Tax the Big Universities - Fund Affordable Housing! 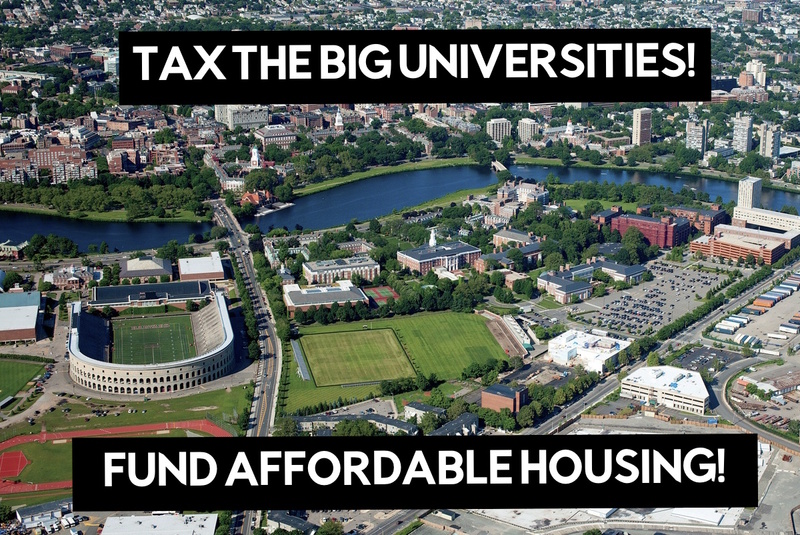 Strengthen PILOT - tax the big universities to fund affordable housing! The City Council should REQUIRE the big universities to make their PILOT payments. No more asking politely! 25% is not enough! Mandate a 50% payment to build high quality public affordable housing Boston. No exemptions for community programs that should be provided for free! Scrap the Boston Planning and Development Agency! No more placing developers’ interests above residents. Scrap the BPDA (formerly the BRA) and replace it with a new planning agency under democratic control by residents, union members, and community members that can make proposals with proper public input to make Boston an affordable city for all! The for-profit housing market cannot solve the housing crisis! We need a system that provides publicly owned, democratically run, permanently affordable HOUSING FOR ALL! There are 58 universities in the Greater Boston area, 57 of them being private. These private universities, despite being multi-billion dollar institutions, are technically non-profits and therefore pay nothing in property taxes while working class Bostonians ours every year. The City set up a program called PILOT, Payment in Lieu of Taxes, whereby they “ask” all the private universities that own $15 million or more in property to make a voluntary payment of 25% of what their property taxes would be to give back to the city. Although technically nonprofits, many of these universities are run just like big corporations. Tuition often exceeds $50,000 per year, putting them out of reach for most Boston natives. They consistently fight tooth and nail against workers when they try to unionize or fight for higher wages, better benefits, and better working conditions. Harvard’s endowment is $36 billion making it the richest university in the world, and Northeastern’s president makes over $3 million per year, a salary more reflective of a corporate CEO than a leader of a nonprofit. While the big universities and corporations like GE are getting away with paying hardly any taxes, ordinary Boston workers and our families pay more than our fair share. And for what? Our public schools are underfunded and housing is unaffordable. We have the 4th highest median rent in the country for a one bedroom apartment, up 5% since just last year, and the 6th highest median rent in the country for a two bedroom apartment, up 4% since last year. The big universities are also a leading cause of gentrification in the city. They don’t have enough on-campus dorms and the dorms they do have are far too expensive. Students are forced to look off campus for housing and landlords use this to raise rents in our neighborhoods. Rents and property values go up all around, longtime residents get pushed out, meanwhile the universities’ property taxes remain at $0. Some colleges even charge an already underfunded BPS for use of their athletic fields. What we need is high quality affordable housing for all Boston residents. The for-profit developers, however, whose luxury condo offensive Marty Walsh and the Boston Planning and Development Agency (formerly the BRA) have been complicit in and even helped to advance, are uninterested in this because it’s not profitable for them. The money for publicly funded affordable housing exists but it’s being hoarded. The City Council should stand up to the big universities and require them to make a full 50% PILOT payment with no exemptions, and direct this added $170 million towards building high-quality, publicly owned affordable housing. While this new revenue gained from a mandatory PILOT will not solve the affordable housing crisis on its own, it can serve as a first step in the movement that needs to waged by the working and young people of Boston to win an end to the housing crisis and affordable housing for all! 1. Strengthen PILOT - tax the big universities to fund affordable housing! -The City Council should REQUIRE the big universities to make their PILOT payments. No more asking politely! -25% is not enough! Mandate a 50% payment to build high quality public affordable housing Boston. -No exemptions for community programs that should be provided for free! 2. Scrap the Boston Planning and Development Agency! No more placing developers’ interests above residents. -Scrap the BPDA (formerly the BRA) and replace it with a new planning agency under democratic control by residents, union members, and community members that can make proposals with proper public input to make Boston an affordable city for all! 3. The for-profit housing market cannot solve the housing crisis! -We need a system that provides publicly owned, democratically run, permanently affordable HOUSING FOR ALL!